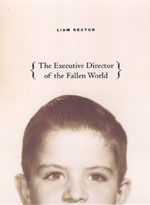 Liam Rector’s new book, The Executive Director of the Fallen World, expresses a stringent yet generous tone toward the profane, ignoble world of his title. Without necessarily forgiving himself or the rest of greedy and needy humanity, Rector chooses instead a dry, somewhat charitable acknowledgment that the world is… worldly. Fatalistic about the behavior of groups, [“Twenty-Three”] is resigned to the fallen nature of the individual. There’s a forgiving element, a sad shrug and smile, in the idea that the vulnerabilities, failings and dreams of our early 20’s persist, somewhere in us, for the rest of life. And though worldly, that notion… suggests the opposite of “disillusion”: The beautiful albeit deluded youth inside us endures, and keeps wanting the world.